Have you signed up for Dry July? As the daughter of a publican, what I’m about to write is pretty much on par with ‘I don’t drink beer’ in the sacrilegious stakes, but it’s for a good cause. This July, thousands of Aussies will bypass booze to support people affected by cancer. One thing I’ve learned from talking to people with cancer is that it can be hard for them to find the time or energy to think about anything other than treating the cancer. Dry July raises money to ease that burden, reduce stress and add a bit of comfort for those affected by cancer by funding programs designed to make their dark days a little easier to navigate. Among the beneficiaries is Mater Foundation (the people I work for) and in recent years, Dry July funds have been used to improve chairs and beds, invest in technology and expand the Art Therapy program at the new Mater Cancer Care Centres. If, like me, you’re partial to a cocktail or three but want to have a go at Dry July, grab a glass and give these mighty mocktail recipes from the team at SodaStream (who are sponsoring this year’s fundraiser) a go. Prepare sparkling water: Fizz 1L of cold fresh water. Gently muddle mint, lemon and berries together in a jug. Add ice, pour sparking water over the top and stir gently. Serve in glasses with lemon, ice and mint to garnish. Enjoy! Prepare sparkling water: Fizz 1L of cold fresh water. 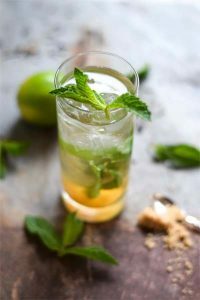 Muddle the lime juice, mint and sugar together in a tall glass until the leaves bruise lightly and the flavours release. Add ice until glass is about 3/4 full and then pour in green tea. Top with sparkling water & garnish with mint leaves. 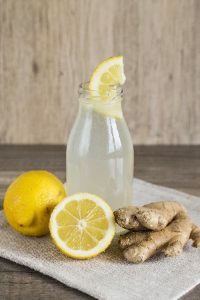 Add flavour with Essence Lemon drink mix. Add lemon juice and sparkling water into a pitcher. Finely grate ginger using a zester. Add grated lemon, ginger and ice. 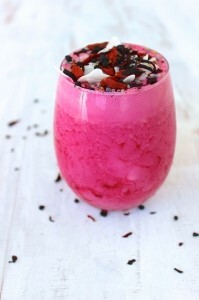 Finally, aside from being insanely pretty, strawberries and acai make for a refreshing and detoxifying smoothie and a great way to kick-start your day. Add ingredients to a blender and process until smooth. For an extra boost, add 1 scoop of vanilla protein to make this a great post workout snack. Serve between two chilled glasses and garnish as desired. If you’ve been thinking about getting a Soda Stream, you can order a Dry July Survival Kit here, with 25 per cent of proceeds going to the Dry July Foundation. Editor’s note: If you don’t have a Soda Stream, you can use bottled sparkling water.